During the summer months the water temperature rises throughout the day. This will make the fish become sluggish and will force them to heavily covered and sheltered places in the water. 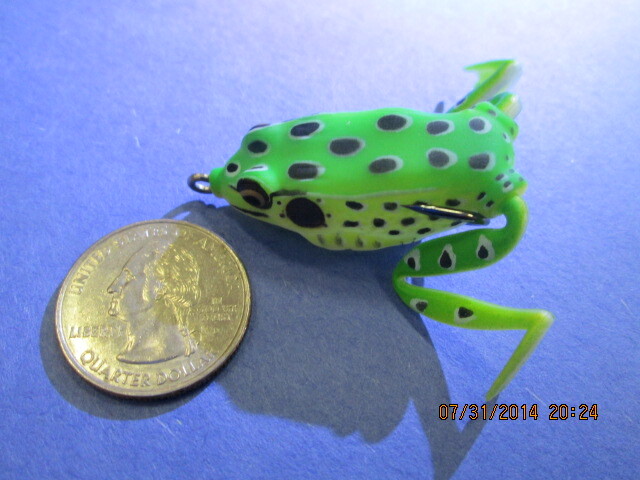 Snag Proof frogs have been catching lunkers for years. Fish will seek shaded areas where they can lay and feed when the opportunity comes along. To fish these areas successfully you must have a lure that is completely weedless. Casting past your target and slowly crawling your bait over it will produce some huge explosion. Remember the fish don’t want to exert too much energy so they will not travel a long distance to feed. But, if they are lying beneath the cover a helpless meal comes right over the top of them, their instincts will tell them to take a swing at it. Koppers makes an extremely realistic looking frog. 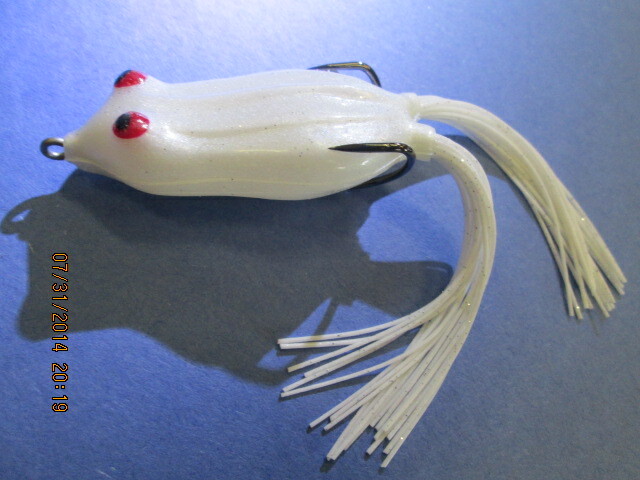 By far the most weedless topwater bait is a hollow-bodied frog. Frogs comes in a variety of colors. Usually when fishing thick cover the fish won’t get a good look at the bait so color may not be that important. 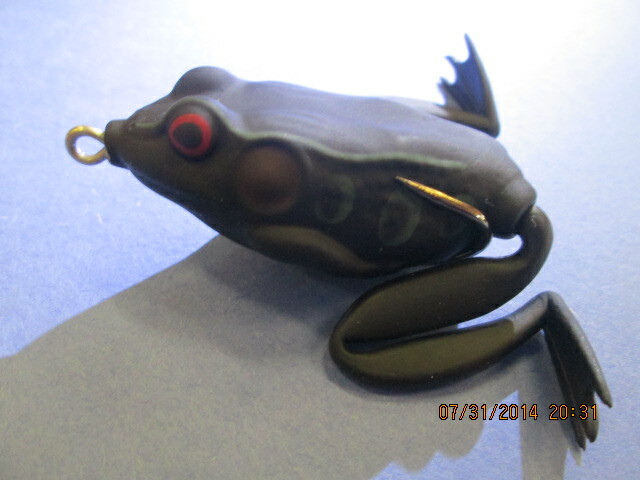 Lunkerhunt frogs have rubber legs that make the frog look like it is swimming. Black creates a solid silhouette, white can be mistaken for small fish and you can’t go wrong with natural looking colors. With a little practice you can twitch the rod a make the bait walk the dog. This side-to-side action seems to trigger fish into striking. 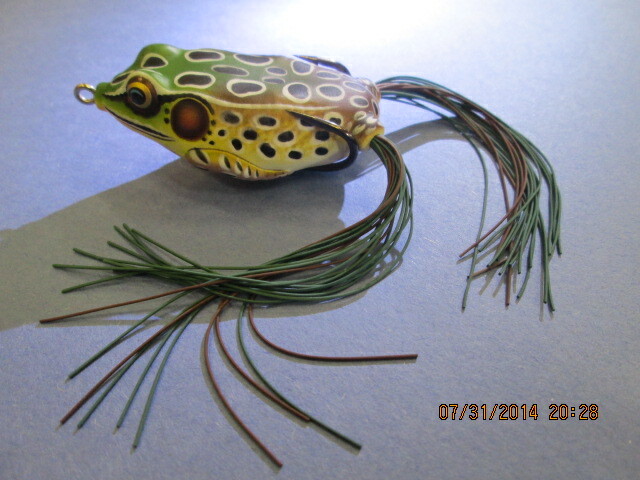 The Lunkerhunt Pocket Frog is a great frog to throw on spinning gear. Frogs work well on any body of water, but they excel when fishing in thick vegetation. The Delta is a great place to try your luck in frog fishing or fish them on small farm ponds. Braided line works best because it will cut through the vegetation and is very strong for its diameter. Be patient and make multiple casts at your target. Don’t set the hook until you feel the weight of the fish on the end of the line.